A menu of pre-conference tours has been arranged to showcase a variety of Continuous Living Cover (CLC) types. 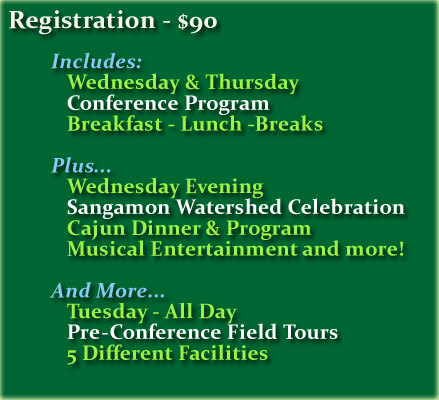 There is no additional fee for conference registrants to attend these field tours. Participants will drive themselves or carpool from Decatur to the tour sites. Agricultural Watershed Institute (AWI) will help arrange carpools for participants traveling by air. Tour times shown are for the tours themselves and do not include driving time to the tour location. Maps and directions will be provided. The AWI—Caterpillar Prairie for Bioenergy site includes farm scale (5 to 30 acre) plots of native warm season grasses and forbs grown for forage and bioenergy and single species demo plots (1/4 to 1 acre). AWI and the University of Illinois have small plots of bioenergy grasses on the grounds of Progress City, Illinois site of the Farm Progress Show (alternating with a site in Boone, Iowa). Also visit on-farm plots with prairie grasses grown as organic field borders and small-scale densification and heating equipment. Participants on this tour will have time to drive to one of the afternoon tours: Goldmine Farm, U of I, or EIU. Learn how Miscanthus fits in to his operation, including the economics. A prairie grass buffer between a stream and the miscanthus provides wildlife habitat. Observe the results of inter-planting corn into a new or weak miscanthus stand. Participants on this tour will have a box lunch at the Rund Farm and will have time to drive to either the U of I or EIU tour. Jack Erisman’s Goldmine Farm is over 2,000 acres and 100% certified organic. He has developed a long rotation that features high value specialty food grade corn, pastures for his cow/calf herd, and cover crops. He also has the first on-farm planting of Kernza intermediate wheatgrass in Illinois. Agronomist Lee DeHaan of The Land Institute, the developer of Kernza, will be on hand. The 320-acre EBI Energy Farm features bioenergy-crop research and production plantings, including sustainable perennial grasses and broadleaved plants, woody feedstocks, and state-of-the-art environmental monitoring equipment. The structure of the Woody Perennial Polyculture system put in place at the research site is the Midwestern Oak Savanna. This structure entails an herbaceous understory, scattered canopy trees, and a variety of shrub layers scattered throughout. EIU replaced its old coal-fired steam plant with a Renewable Energy Center (REC) that houses four boilers. Two boilers burn biomass, initially wood chips but they may burn grass in the future; the others burn natural gas with a fuel oil backup. EIU professors have established grass and tree bioenergy plots on campus plus a 100-acre research / production plot on the Lumpkin Family Farm located a few miles from campus. EIU conducts wildlife studies on its plots and the Lumpkin and Rund farms. NOTE: The REC tour will be capped at 10 participants. This is an annual AWI event. Conference registrants and local watershed stakeholders will join to learn about and celebrate the resources entrusted to our care. After the conference adjourns, the GLBW Perennial Biomass Working Group and the Midwest Conservation Biomass Alliance will host a structured discussion of challenges and opportunities for scaling up production of, and markets for, perennial biomass crops. This meeting is intended to provide input for a Perennial Biomass Initiative, including experimental watersheds in which perennial grasses are grown for co-production of harvested biomass and ecosystem services and energy conversion technologies are demonstrated. Conference attendees interested in participating in this effort are welcome to stay for this meeting. If you expect to participate, please contact AWI before the conference to ensure that seating and handouts are available.